(CNN) -- Iberian Airlines has said it plans to cut jobs and target pay to save more than €200 million ($272 million) after announcing worse-than-expected Q1 results Tuesday. 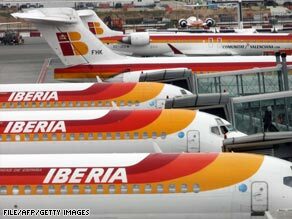 Iberia Airlines has said it plans to make cuts and review investments after worse-than-expected results. The troubled airline said it lost €92.6 million ($126 million) during the first three months of 2009, adding that it was unlikely to post a profit in 2009 under current economic conditions. Iberia lost €28.3 million ($38.8 million) during the same period last year. Analysts had forecast a loss in the region of €117.5 ($161 million) for the same quarter this year. The airline said it had been hit by a decline in overall traffic accentuated by a dropoff among business travelers. Speaking to CNN's Charles Hodson, Iberia's CFO Enrique Dupuy said he still expected the airline to eventually merge with British Airways. "We are confident that we will be able to reach an agreement in the future," he said. Dupuy said that issues that still needed to be tackled included a shortfall in BA's pension fund. Iberia, which says it flew 28.5 million passengers in 2008, said it plans to to save between €110 and €125 million (between $150 and $170 million) by targetting labor costs, capacity, spending and investments. Investments which will now be delayed included the construction of crew facilities at Madrid's Barajas airport; and IT computer upgrades that are not linked to business operations nor passenger needs. The airline said it had also been in talks with unions, to implement job cuts, with flights, which has seen biggest decline in activity, likely to come under scrutiny. The airline is also freezing executive salaries and new hires, not renewing temporary contracts, freezing new hires and keeping a lid on salaries. Contracts with suppliers will also be reviewed, Iberia said, with the purpose of cutting costs and looking at new ways of working together. -- CNN's Al Goodman contributed to this report.